Foosball is a game where your accuracy and reflexes are placed to the test. One aspect that beginners often miss out on is holding the handle properly. That's why we want to help you learn about foosball handle form so that you can become a better player. Understanding how to hold your foosball handle is very important to your accuracy. Also, your shot speed and performance is directly related to how you hold the handle. People who are new to foosball tend to hold the handle with a tight grip. This is counter productive because it's a bad habit that's carried by sports such as tennis. 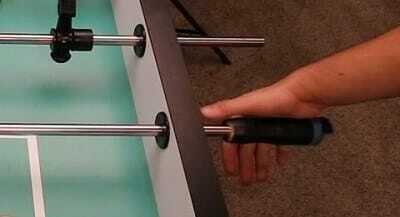 Some golf players understand the mechanics of foosball and tend to hold it with a more relaxed grip than usual. Think about it, by holding the handle with a tight grip; you lose the mobility to move to other handles freely. Foosball is a game of skill and finesse, and your grip needs to be held correctly. 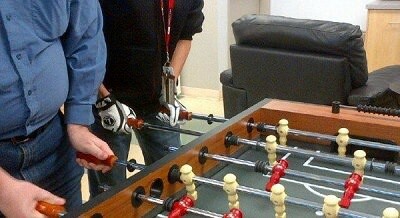 Make sure to keep a light grip on the foosball. Having a light grip on the handle makes it easier for you to move around. Also, it helps you limit your resistance as the rod allows you to move more fluidly. Pull Shot: When you place the rod near your body and shoot the ball in the goal in one fluid motion. Make sure to understand the basics of shooting before trying to increase your speed. Push Shot: This is different than the pull shot because you place the rod away from you. Don't keep this as your main shot, but use it with other techniques to get the edge over your opponent. ​Spray Shot: Spray shots occur when the ball is shot at a diagonal angle towards the wall or goal. The ball will move in the same angle as it was being shot. If you use a spray shot on a push shot, the ball moves to your opponent's goal. For pull shots, the ball will move towards your goal. 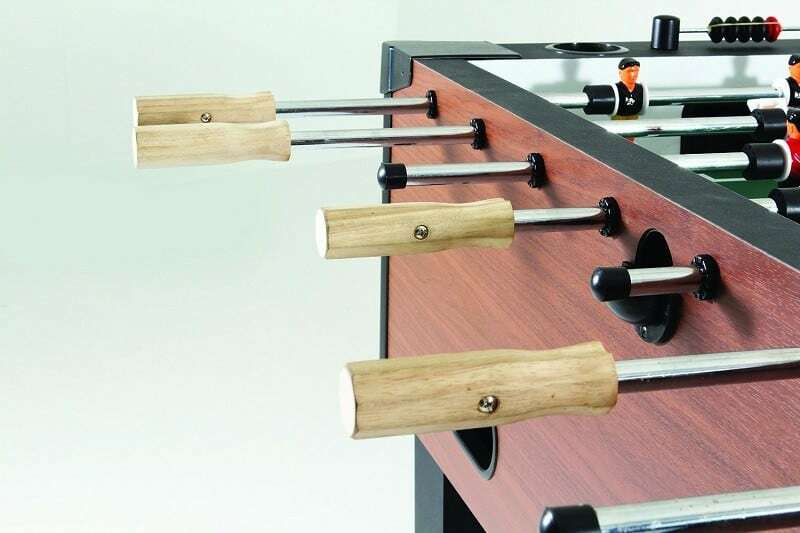 Tic-Tac Shot: A tic-tac shot is when you pass the ball between two foosball men on the same rod. Combined with a shot, it makes a goal that's hard for amateur players to predict. It's used to weaken the opponents defenses and should be used as a trick shot. You'll know that you're holding the handle correctly if you feel that there's a gap between your skin and the handle. Holding the foosball handle too tight will result in it being completely covered by your hand. Remember to hold them in a relaxed position to maximize your performance. This grip is used for making more advanced shots such as the snake shot. Your hand must be in an open position with your wrist and the bottom part of your hand on the handle. This makes it so you can create trick shots with more precision and cause the men on the board to move faster. Here are some tips on how you can improve your foosball grip. The main way to improve your grip is by using foosball handle wraps. Wraps help you create more complex shots to win against your opponents. You'll most likely see professional foosball players use this piece of equipment to perform better during competitions. To use a wrap begin by placing one end of the wrap closest to the table. Then, use your right hand to hold the handle. After that, use your left hand to rotate the remaining wrap around the hand. If you see any gaps in your foosball wraps, try applying at a larger angle. A pair of foosball gloves can make a huge difference in how you'll perform. Some players tend to play foosball naturally. While others tend to use foosball hand wraps and gloves to get the edge over their competition. 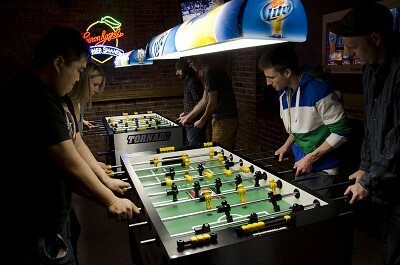 Still, we suggest getting a pair of foosball gloves if you plan on playing foosball professionally. Knowing how to control your foosball handles is important. You need to practice proper hand positions and movements to become better as a player. Doing this allows you to improve your accuracy and play at a professional level.